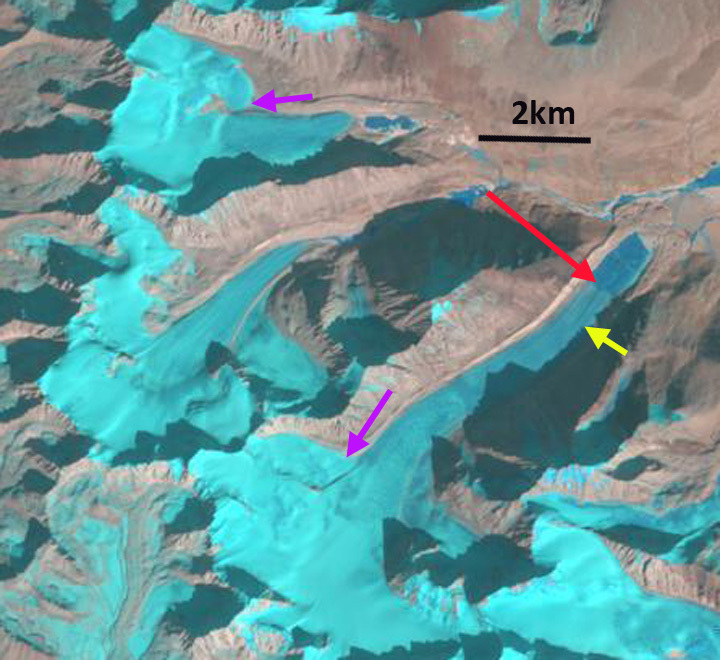 Ribuktse Glacier drains east from 6200 m peaks along the Nepal-China border. The glacier ends in a lake that drains into Ribuktse Tso, the Yarlung Tsangpo (Zangbo), which becomes the Brahmaputra River. The Zangmu hydropower project is being constructed on the river, it is a 510 MW project. Here we examine Landsat and Google Earth imagery from the 1991-2014 period. This is a region where Li et al (2011) noted that increasing temperature, especially at altitude, the fronts of 32 glaciers have retreated, mass losses of 10 glaciers have been considerable, glacial lakes in six regions have expanded and melt water discharge of four basins has also increased. Neckel et al (2014) examined changes in surface elevation of the glaciers and found this region lost 0.44 m/year from 2003 to 2009. 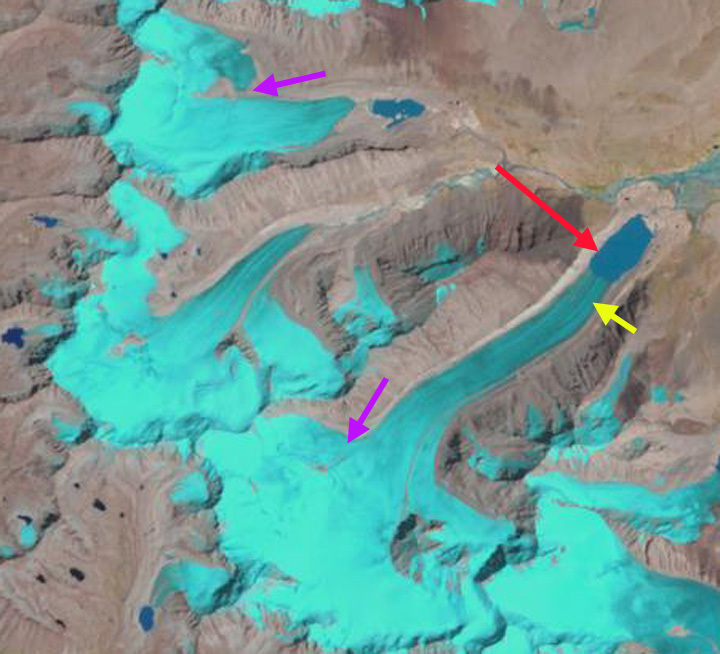 In 1991 the glacier ends in a proglacial lake at the red arrow, the yellow arrow is the 201 terminus. The lake at an elevation of 5050 m is 1.1 km long and 600 m wide. 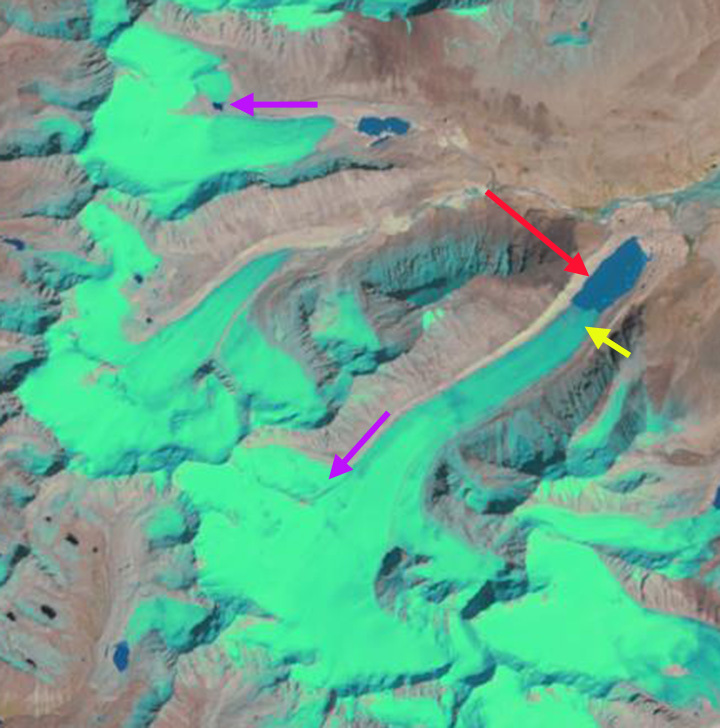 The purple arrow indicates two tributaries that connect to the larger valley glaciers. By 1998 the lake has expanded. The tributary to the glacier to the north of Ribuktse has separated from the main glacier. In 2000 and 2001 the tributary to the Ribuktse Glacier is still connected to the main glacier. The terminus continues to retreat with lake expansion. 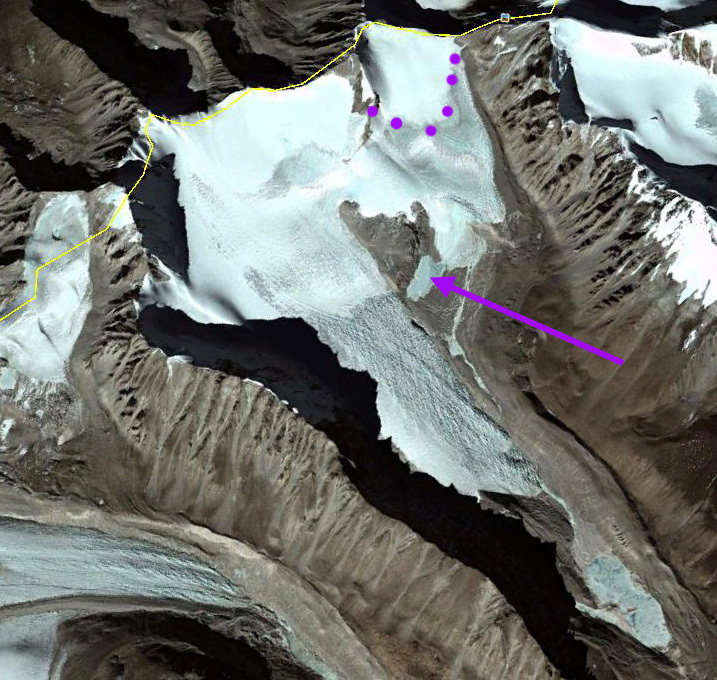 By 2005 the lake is 1.8 km long and the tributary is no longer visibly in contact with the main glacier at the purple arrow. 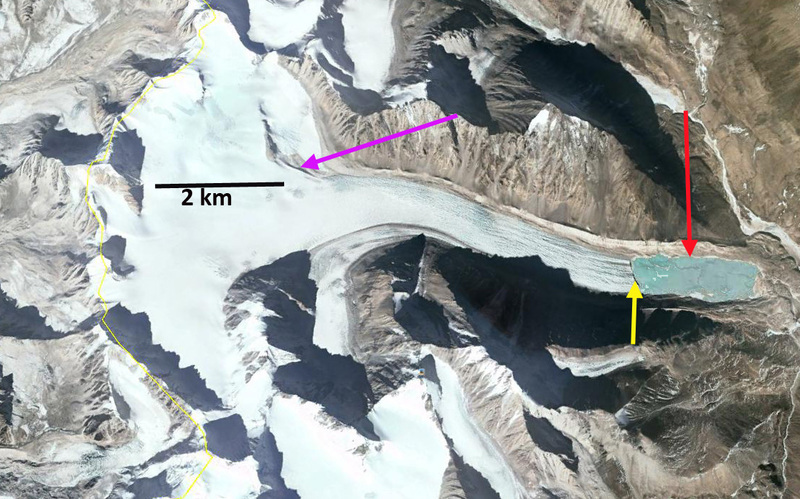 In 2014 the terminus has retreated 800 m since 1991, the lake is 1.9 to 2 km long and the tributary has significantly separated form the main glacier. At the glacier just to the north the tributary separation from the valley glacier has led to a new glacier lake developing by 2011. 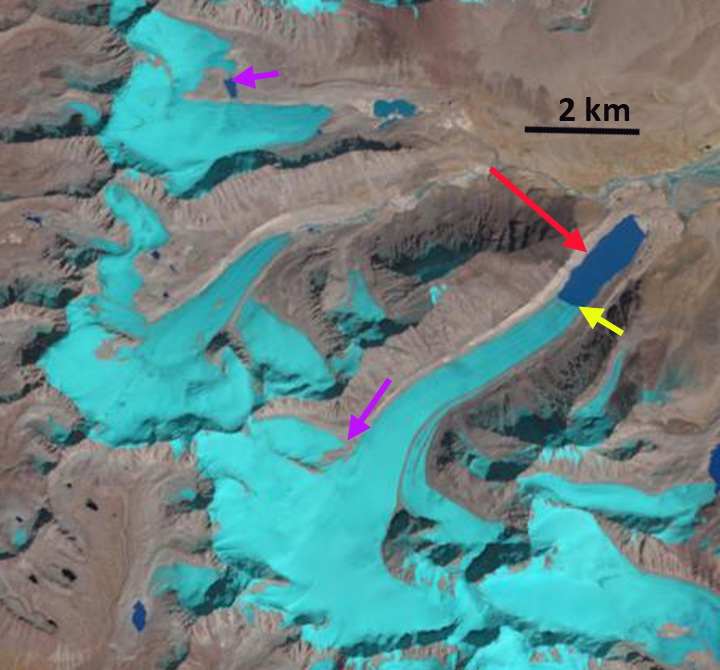 There is little evidence of calving from Ribuktse Glacier. 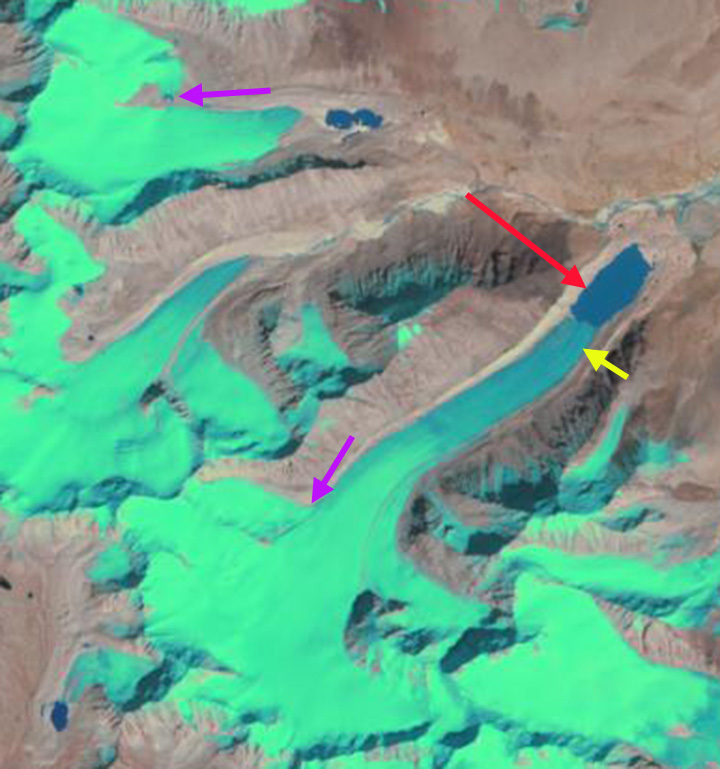 The retreat of the low slope glacier tongue in the proglacial lake lacking calving will continue at a slow rate. The high elevation of the glacier terminus area limits the magnitude of ablation on the glacier tongue. The retreat follows the pattern of the Yemayndrung Glacier just to the south, Durung Drung Glacier, India, Reqiang Glacier, China and Matsang Tsanpo Glacier, China which are in a similar climate setting. This area did get an unusual heavy October snowfall from Cyclone Hudhud this week. 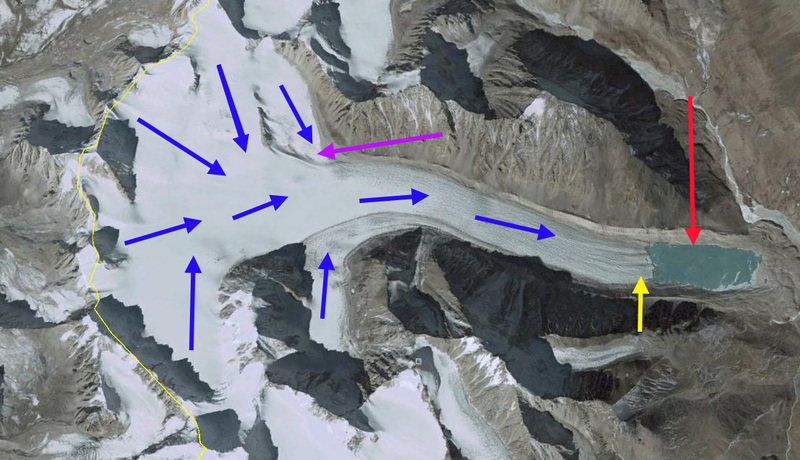 This entry was posted in Glacier Observations and tagged Brahmaputra River glacier retreat, china glacier retreat, Ribuktse Glacier retreat, tibet glacier melt, Tibet glacier retreat, Yarlung Tsangpo River glacier retreat. Bookmark the permalink.